My CMS | We Buy Ugly Cars and Sell Pretty Ones! Ever come out in the morning and say, “What the #$%$!! is that spot under my car????? Well that spot could or could not be serious but we have to figure it out. In this blog we will cover the six most common fluid leaks from a car—from the leaks that will leave you stranded, to the leaks that should be in fact be happening. Yes, there are times when fluids should leak naturally from your car, and we will cover that as well. Let’s try to figure out what fluid is leaking from your car and what you should do about it. First of all, before you start worrying, make sure the fluid leak is coming from your car and not the vehicle that was parked in that spot before you got there or from a previous time period. Just grab a flashlight, get down on one knee, and take a good look under your car. If the fluid is coming from your car, you need to determine the fluid’s color. The best way to do that is to slide a piece of white cardboard or a piece of plywood under your car and let the car drip onto it. Capturing the drip this way will enlighten you in two ways: one, it will reveal the color, and two, it will give you a good indication of where the fluid is leaking from. First, without moving the board, notice where the drip is hitting the board; turn your head and look up from this point at the bottom of your car and see exactly where your leak is coming from. Once you have a clear view of where the fluid is leaking from, remove the board and check the color. I left brake fluid out of this list, because it’s not common for brake fluid to leave a puddle under your car. Nevertheless a brake fluid leak is potentially serious (see my article about common brake problems). Just for quick reference, brake fluid color is clear to amber, and smells like fish oil; if you doubt me, take the cap off the brake fluid reservoir and sniff the cap. The three H’s–hazy, hot and humid—are probably the most common cause of fluid leaking from a car, in the eastern U.S. at least. A car’s air conditioner needs to do something with the moisture it removes from the air inside the passenger compartment. It drains the water onto the ground under the car, via a rubber hose. On very humid days, the water will pour out of the air conditioner drain onto the ground like from a faucet, until the cabin humidity is almost gone. This is what I meant earlier when I said that some leaks are supposed to happen. This hose is usually at the front right (near the area where the passenger rests their feet) or in the middle of the cabin. If you have a newer minivan or large SUV with front and rear climate control, it’s possible to have two evaporators and two air conditioner drains, one in front and one in the rear. Dual climate control on a 2011 Honda Pilot. 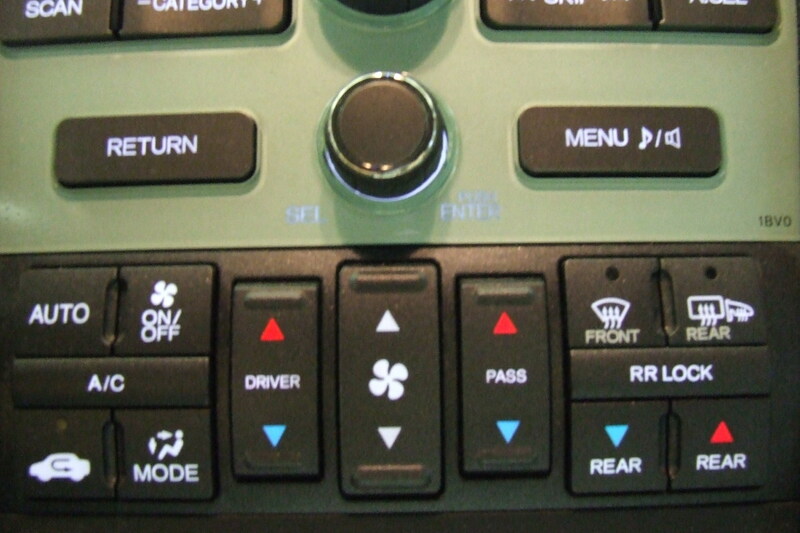 The rear controls are the blue and red arrows at right under “RR lock.” Fan speed is controlled from the rear controller. 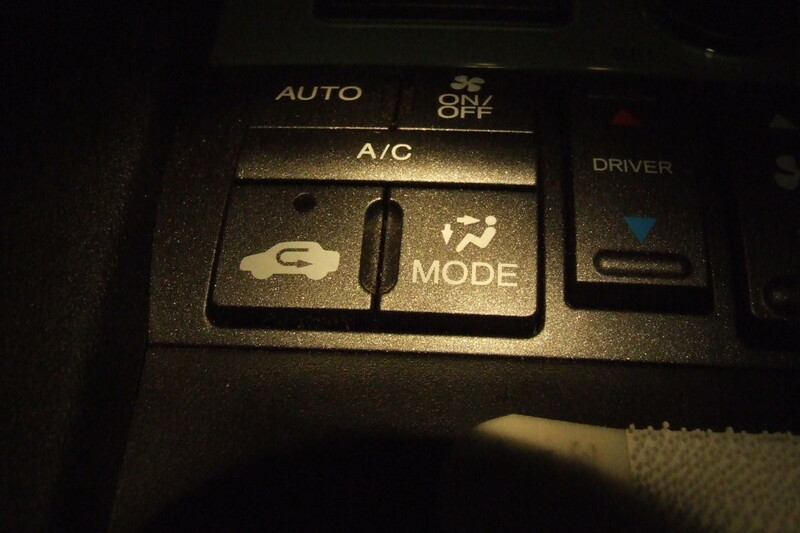 Here’s a tip: when you use the air conditioning system, it’s best to keep the recirculation button in the “on” position rather than the “fresh air” position (see picture below of the recirculation button on a Honda). If you leave the car in “fresh air” mode, it will continue to drag humid air into the car, the vehicle’s cabin will never reach optimum temperature, and sometimes when the weather is extremely humid, the air will turn into fog as it pours from your vents into your car’s passenger cabin. If you ever experience this phenomenon, reach over and push the recirculation button. The recirculated air will lose humidity on each pass through the evaporator, and your air conditioner will be working at maximum efficiency (see this article on how to defog car windows fast). Recirculation button (at left) next to the fresh air button (at right) (2011 Honda Pilot). The recirculation button should be on when using air conditioning, but should not be on otherwise; it will fog up your windows. Engine oil, or “motor oil,” may vary in color from light amber to dark brown, depending on how well you maintain your car. If there is an oil leak, common sense tells you that it will be under the engine, but it’s not always immediately obvious where your engine is located. Don’t laugh: on a front-wheel-drive car, your engine could be located at the front left or front right, depending on where the transmission sits, and the engine could be in the rear of the car if you’re driving a Porsche or a VW bug. Once you figure out the oil is dripping from the engine, all you have to do is pinpoint the leak. You might want a mechanic to take a look at it if you can’t find exactly where it is leaking from. Oil leaks can come from some pretty obscure sources, like a crankshaft seal under the timing cover, or they can come from something easy to spot like a valve cover gasket. If you know you have an engine oil leak, check your dipstick frequently. Do not drive a car that’s low on oil. It will overheat and damage itself. If you have a massive oil leak do not drive your car at all. Notice the brownish color of the motor oil or engine oil. Coolant comes in many colors now; it used to be green, but now its color depends on the manufacturer of the car or the coolant. Honda provides a blue coolant, Mercedes uses clear, Toyota uses red, and I have seen orange, green and all the colors of the rainbow. Coolant has a sweet smell, like candy, and also a sweet taste. Don’t taste it—it’s half ethylene glycol, which is poison—but I have tasted it a few times in my career, not by choice. Honda brand coolant is blue. A coolant leak could be almost anywhere, because of all the coolant hoses that surround your engine. Some coolant hoses (the heater hoses) go into the passenger compartment itself. But the most common place for a coolant leak is your radiator, and that will be located behind the grill in the very front of the car. If you suspect you have a coolant leak, you may be able to smell it. Take a quick glance at the coolant overflow tank, it is usually see-through and has “high” and “low” markings on it. If it’s empty, or you aren’t sure what you are seeing, let your engine cool completely and look in the radiator. (Do not remove the radiator cap on a hot engine. It could blow hot coolant or steam into your face and cause severe burns.) If you can’t see any coolant when you are peering down into the radiator, you may have a leak. You don’t want to drive a car that has lost a massive amount of coolant. It can overheat and ruin the engine. Keep an eagle eye on the temperature gauge. Or better yet, tow it to where it can be fixed. Heed the warning! Don’t take the cap off a hot radiator. You should see coolant when you look inside the radiator. Automatic transmissions use red or pink fluid, and lots of it. Very often, the first sign of an automatic transmission leaking is that the transmission will start to slip (the car will rev without going into gear). If the leak continues, eventually the car will not move at all. Automatic transmissions use fluids specially formulated by the manufacturer. If you don’t use Honda-made automatic transmission fluid (ATF) in a Honda automatic transmission, you will compromise shift quality and void your warranty, so I recommend following Honda’s guidelines and using their recommended fluids. Standard (“manual”) transmissions use gear oil (like heavy, strong-smelling motor oil; see “Gear Oil” below) or the manufacturer’s proprietary manual transmission fluid. 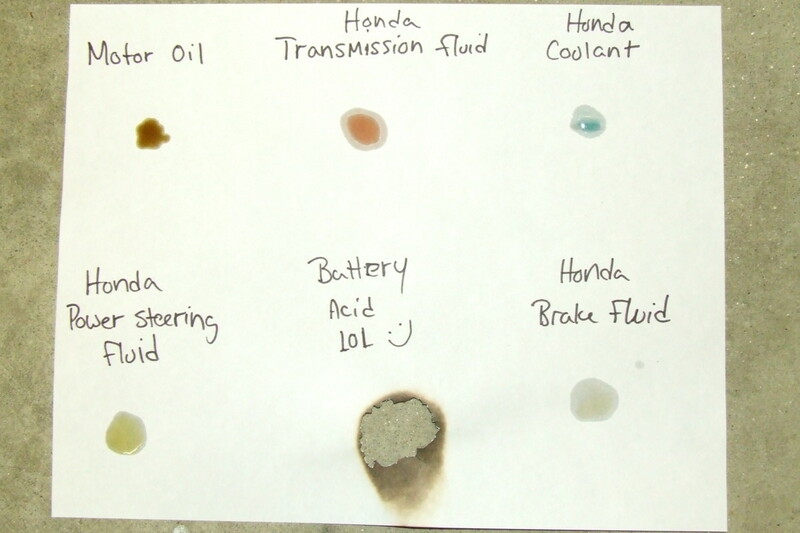 Very old Hondas use regular motor oil in their standard transmissions. The most common place for a transmission fluid leak on a front-wheel drive car is the axle seals; on a rear-wheel-drive car it is the output shaft seal. If you see red or pink fluid under your car, pull the transmission dipstick and check your transmission fluid level. Check the owner’s manual for the proper way to check transmission fluid, different manufacturers have different ways of checking transmission fluids. Some manufacturers don’t even let you check the fluid: the last model of the Honda Passport had no way of checking the transmission fluid—weird! The end of the transmission fluid dip stick. Notice that the fluid is red. Differential fluid, hypoid, gear oil, or gear fluid: whatever you call it, it’s very thick, it looks like honey, and it smells like a warm, greasy Mack truck sitting at a truck stop. If you get this stuff on your hands the smell doesn’t go away for days. Gear oil is dark brown, or dark amber if it’s new and clean. If your rear differential is leaking, or your standard transmission has a leak, you will find this fluid dripping. Gear oil can also leak from the wheel bearing seals or rear axle seals. Sometimes you will see oil being slung from the center of the wheel all over the wheel rim of the vehicle. Dust will collect on the wheel and turn black. If you have a four-wheel-drive car, gear oil can leak from the front axle as well. The smell alone will enable you to determine if it’s gear oil or not. If you have any questions about a fluid leak in your car, just leave me a comment in the comment section below and I will respond quickly. Your experiences are useful to me and others. If you found this information useful, please share it, for example by using the Facebook and Twitter buttons at the top of the article. What’s that spot under my car??!!! 0 0	What’s that spot under my car??!!! Car Maintenance Cheat Sheets-Print and Save! 0 0	Car Maintenance Cheat Sheets-Print and Save! This article is for all of you out there that HAVE to get to an even number, the nearest dollar, etc. when gassing up your car. The question is, is this really good for your car??? Well, the short answer is NO! Many of the last drops of gas are managed by your vehicle’s Evaporative Emissions System or evap system for short. If the system senses vapors, it will hold them in a canister. When you overfill your tank, this is where those extra vapors go. The extra gas vapors go into the charcoal canister. The vapors are then pumped back into the engine and burned. Liquid fuel can make the charcoal in the canister break apart. When the charcoal breaks apart it gets pumped back into the engine. The charcoal being pumped back into the engine is not the issue, the issue is the damage done to the canister and the control valve. nd flush the engine to get all the remaining charcoal out of the system. Now ask yourself, was it really worth adding that last little bit into the engine???? Should you add those last few drops of gas to round up? 0 0	Should you add those last few drops of gas to round up? How to Jump Start Your Car-Easy Print and Save Diagram!!! 0 1	How to Jump Start Your Car-Easy Print and Save Diagram!!! Weather.com offers a lot of helpful tips on how to stay as safe as possible if you are in your car during a tornado. One of the main rules: Don’t hide under the embankment of an overpass. While it may seem like a safe move, you’re actually increasing your risk of injury or worse, according to Weather.com. You’re more likely to be struck by debris, the wind is stronger than at ground level, and the wind will change direction as the vortex passes, according to a 1999 presentation from the National Weather Association. Other things to remember: Get to shelter if you can, which is the preferable option. But assuming you’re in the middle of nowhere in your car with no other options, The National Weather Service recommends one of the following two actions, depending on specific circumstances. 1. Stay in your car with the seat belt fastened. Slump down below the windows and cover yourself with a blanket. Weather.com advises you to keep the car running so airbags will deploy if necessary. 2. If you think you can safely get lower than the roadway, “exit your car and lie in that area, covering your head with your hands,” according to NWS. Be sure to get far enough away from the car so debris, or the car if it gets tossed by wind, is less likely to hit you. Your car is safer then a mobile home according to the Red Cross; so stay safe and follow the above tips! Safety tips for driving during a tornado! 0 0	Safety tips for driving during a tornado! Take something comfortable to sit on, lie on; think BEST chairs, blankets, pillows, etc. And if it is going to be a long season; check out THESE CHAIRS! Fill up with gas BEFORE you get into town and to help you- check out the Gas Buddy App that will find the cheapest gas and get you there. Book the hotel the night/week before and call for a late check in. Try and use a hotel booking site; unless you have to stay with the kids, so you get rewards and benefits. If it is going to be a group dinner-make a reservation. If it is going to be with kids-make sure it is family friendly. Find out what else there is to do. Easy enough if it is just adults, but you might want to plan ahead if you are going to have down time with the family, for family planning: check out this app! ADD TIME onto everything-otherwise you will miss that first pitch, kick off, etc. See if there is a public transport near your event-so you can park ahead at the hotel/campsite and not worry about the car, be aware of local transit, or download an app for public transit. Be prepared to have to walk to the event-extra money, extra time. But if you are REALLY thinking ahead, you will download one of these apps which will tell you where to park! Have the time of your life, these days are special. Travelling to a baseball game this spring or summer? Here’s what you need to know! 0 0	Travelling to a baseball game this spring or summer? Here’s what you need to know! Winter tires are one of the most misunderstood aspects of winter car care. A lot of drivers believe that winter tires are the same as snow tires, and feel that if they don’t typically have a lot of snow – or if the roads are usually dry – then they can get away with all season tires. The reality is, winter tire rubber compound are far more effective at gripping not just in the snow, but also on cold pavement, where they can improve braking by as much as 40 percent once the mercury drops below freezing. All season tires use rubber compounds that stiffen at low temperatures, making them less safe than their winter counterparts, and they should be avoided if you live somewhere that regularly sees 40 degrees Fahrenheit or less during the winter months. Be safe and drive safe. Are your tires ready for the snow????? Read now! 0 1	Are your tires ready for the snow????? Read now! Windshield washer fluid is something you can never have enough of during the winter, as it’s a crucial part of maintaining visibility during the slushiest, snowiest parts of the year. It’s important to understand that winter washer fluid (which usually contains antifreeze) is not formulated in the same way as summer fluid. Summer fluid contains a lower alcohol mixture, which means that in extreme cold weather it can actually freeze in your reservoir under the hood. This doesn’t just mean the fluid won’t answer the call of duty when you flick the switch inside the car, but it can also crack tubing and the reservoir itself, leading to nuisance repairs. Before the temperature drops, replace your windshield washer fluid with winter fluid, which is specifically formulated not to freeze during weather that would make a reindeer think twice about venturing outside. Winter Car Tip-check your fluid!!! 0 0	Winter Car Tip-check your fluid!!! 0 0	Winter tire safety-please read! Help the car breathe-Changing the air filter allows your car’s engine to run cleaner and more efficiently. Also be aware of the battery. If the car is slow to start, headlamps are dimming or interior lights flicker it might be time to change out the battery. Stop and go drivers in heavy traffic need to check these items more regularly. Stay cool-Make sure your car is equipped with enough coolant to keep it cool. Check these hoses regularly. In addition, cars need at least 3 minutes to warm up. Pressure check-make sure the tires are inflated to the correct levels and check the tread and wear. Rotate the tires every 3,000-6,000 miles. Tire problems are the number one leading cause of breakdowns. Avoid Exhaustion-The exhaust system should be checked annually along with other items in the vehicle’s annual checkup. This includes the muffler, catalytic converter and other parts of the exhaust system. Change Routinely-Routine checkup will also include all fluid levels, fuel filter, belts, hoses, PCV values and spark plugs. Drive Smart-The way we drive our car could cause the most wear and tear on our vehicle than anything else on the list. Stopping and accelerating quickly as well as overuse of the brakes are the worst habits for the longevity of our cars! Easy Maintenance for your car’s long life! 0 1	Easy Maintenance for your car’s long life!